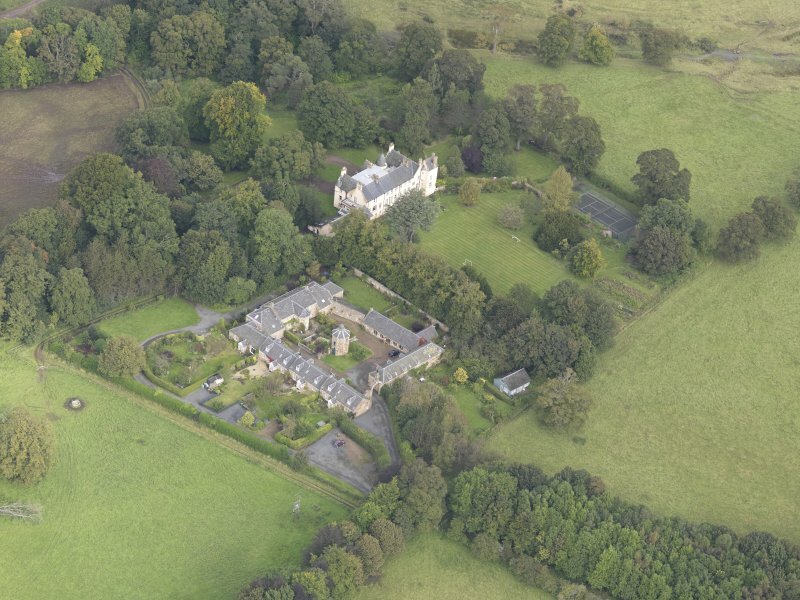 General oblique aerial view of Keith Marischal Country House with adjacent stables, looking to the W.
General oblique aerial view of Keith Marischal Country House with adjacent stables, looking to the N.
General oblique aerial view of Keith Marischal Country House with adjacent stables, looking to the NE. 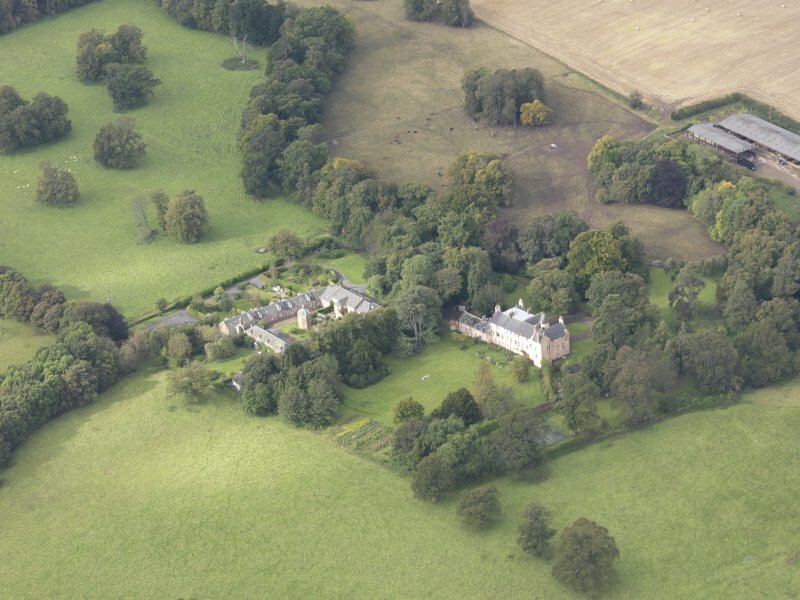 General oblique aerial view of Keith Marischal Country House with adjacent stables, looking to the SSE. 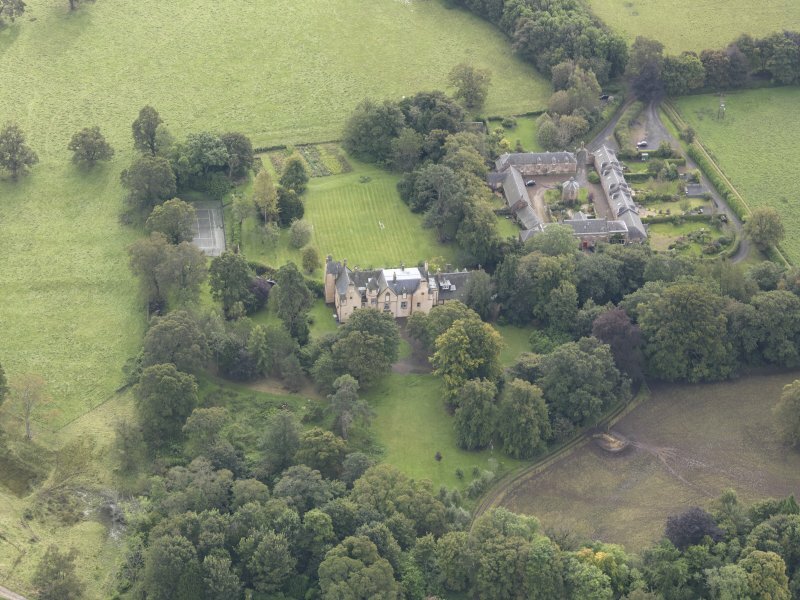 General oblique aerial view of Keith Marischal Country House with adjacent stables, looking to the S.
General oblique aerial view of Keith Marischal Country House with adjacent stables, looking to the ESE. 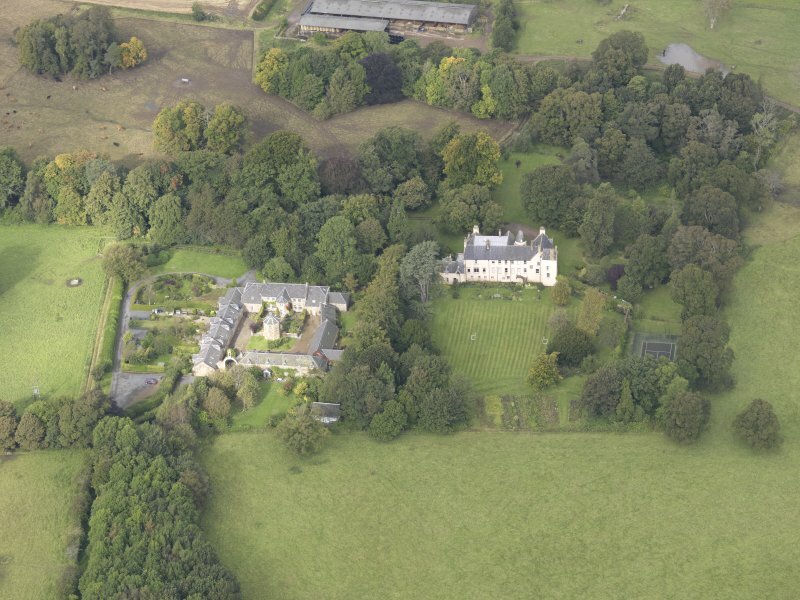 General oblique aerial view of Keith Marischal Country House with adjacent stables, looking to the NW. 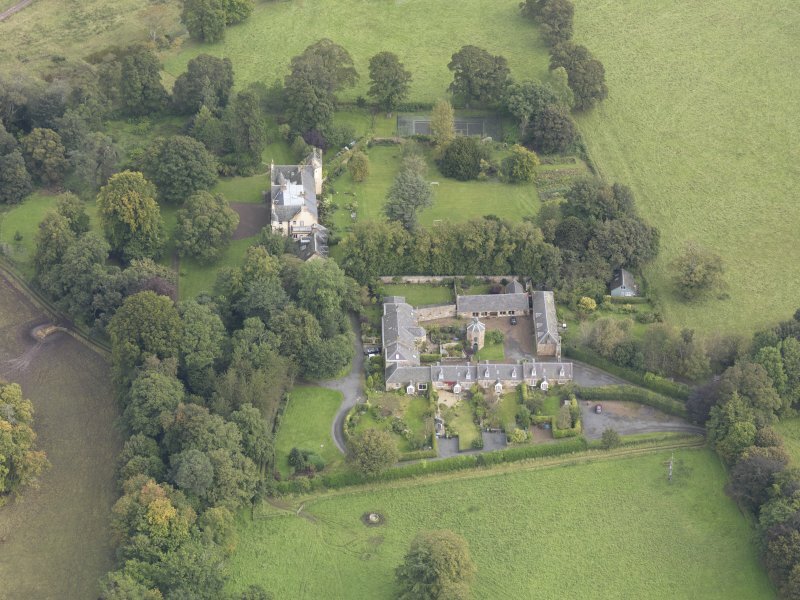 General oblique aerial view of Keith Marischal Country House with adjacent stables, looking to the NNW. 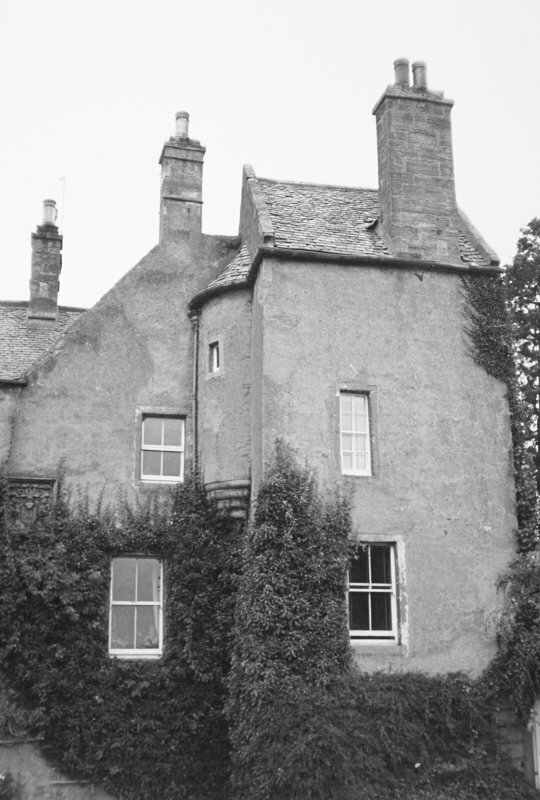 The building as it now stands consists of the original late 16th c L-planned house, to which has been added an L-shaped extension, to form three sides of a square. 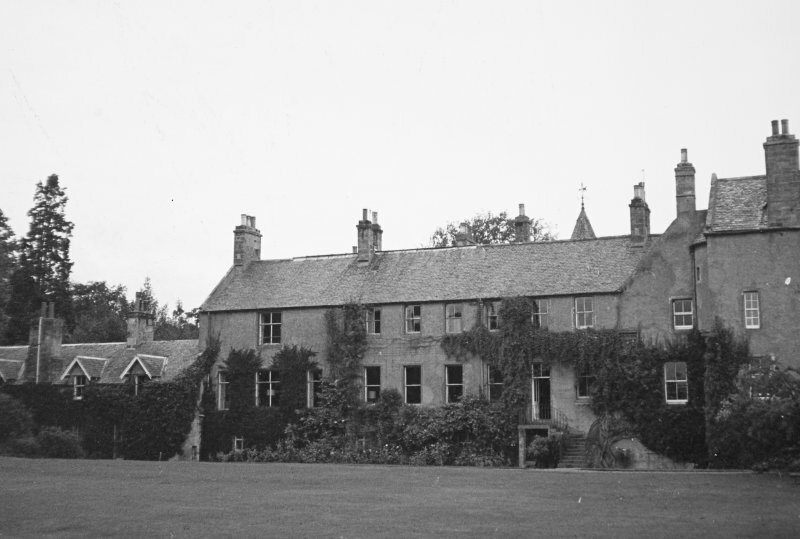 The hollow of this was filled in towards the end of the 19th c. Almost the entire roof-line was altered at this last period, and the crow-stepping of the gables has disappeared. 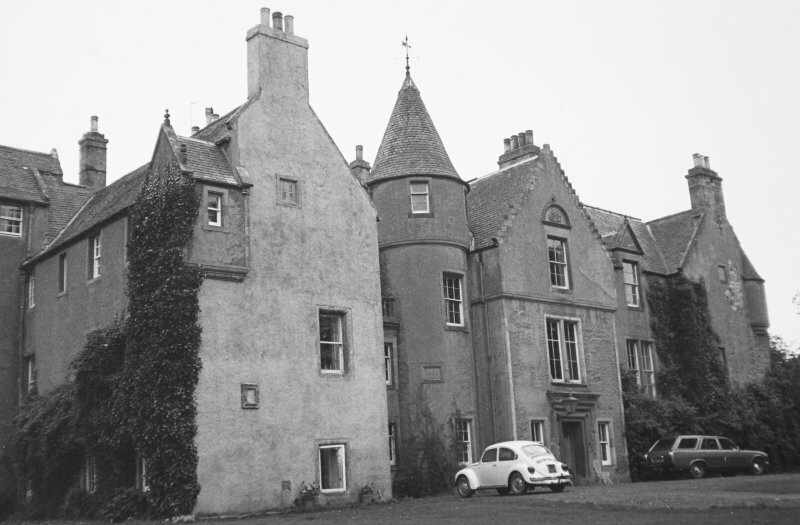 The original house appears to have been a moderate-sized laird's house on an unusual version of the L-plan, a lofty, square tower projecting at the outer angle of the 'L'. 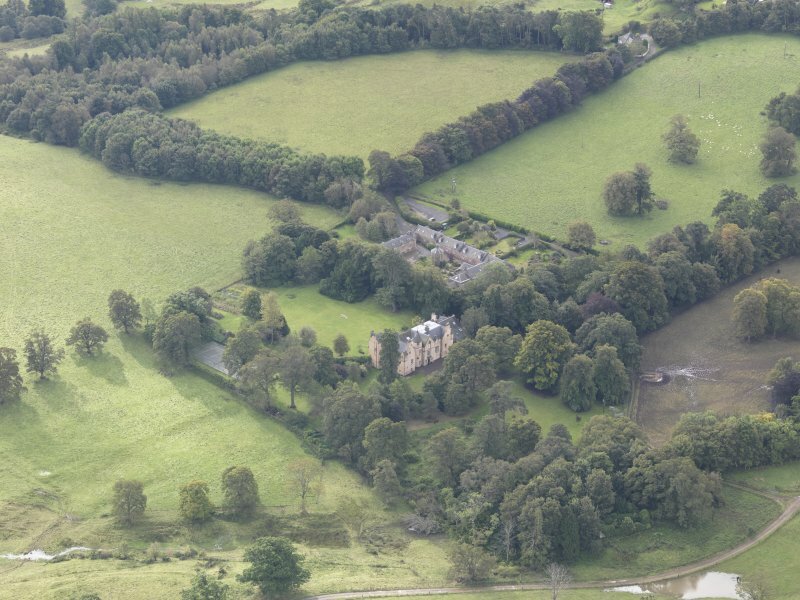 This was reputedly built by George Keith, 5th Earl Marischal, in 1589, though it is possible that he merely added to an earlier house. Keith Marischal is generally as described. 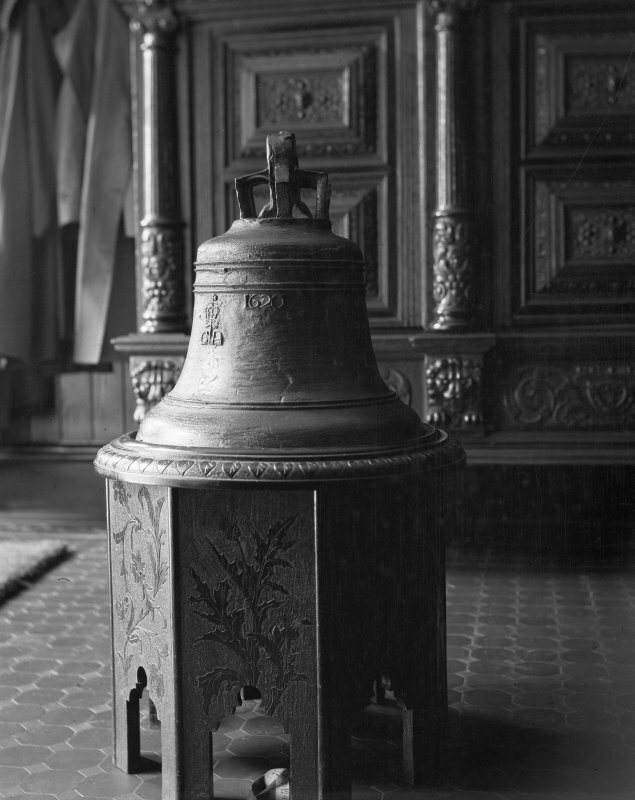 A bell, dated 1620, is situated over an archway at NT 4490 6431. Visited by OS (BS) 29 July 1975. 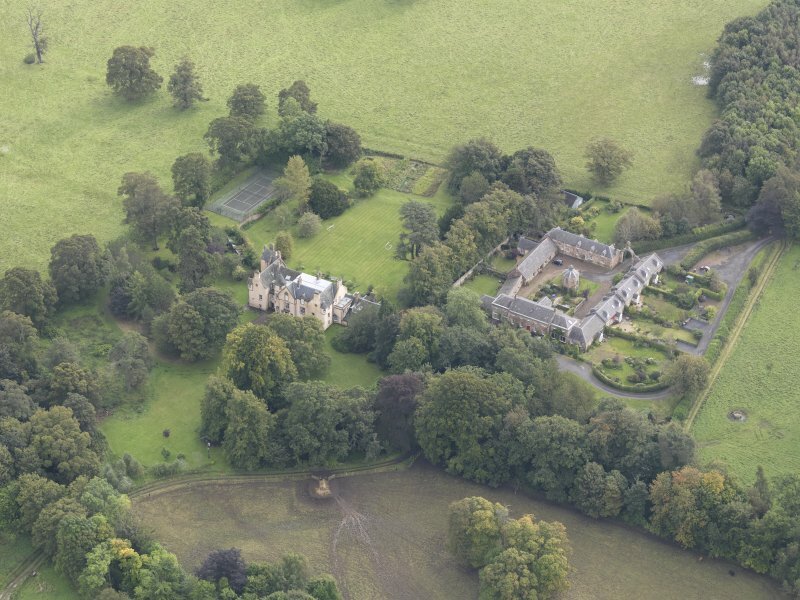 Building work at Keith House and Nether Keith. 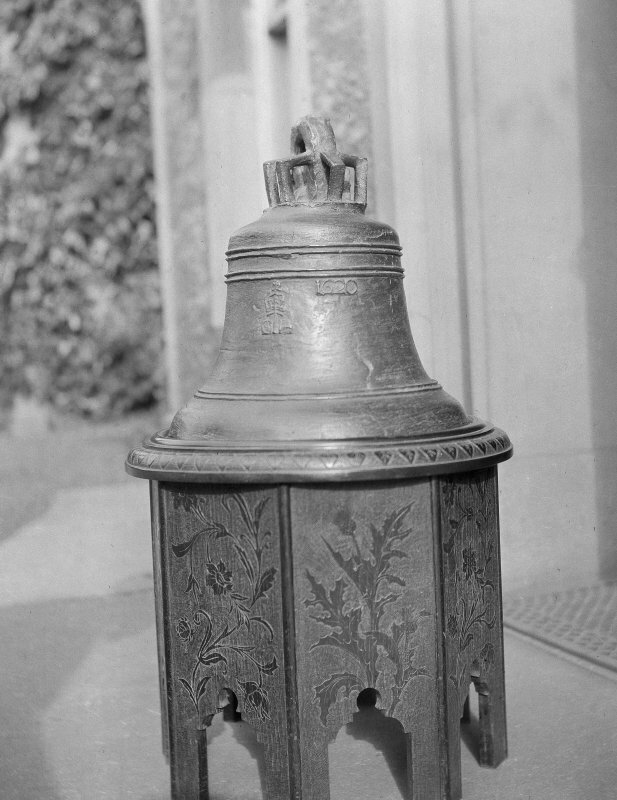 Letter from Alexander Stevens, architect in Edinburgh, to Alexander Williamson, 16 St James Square, Edinburgh. 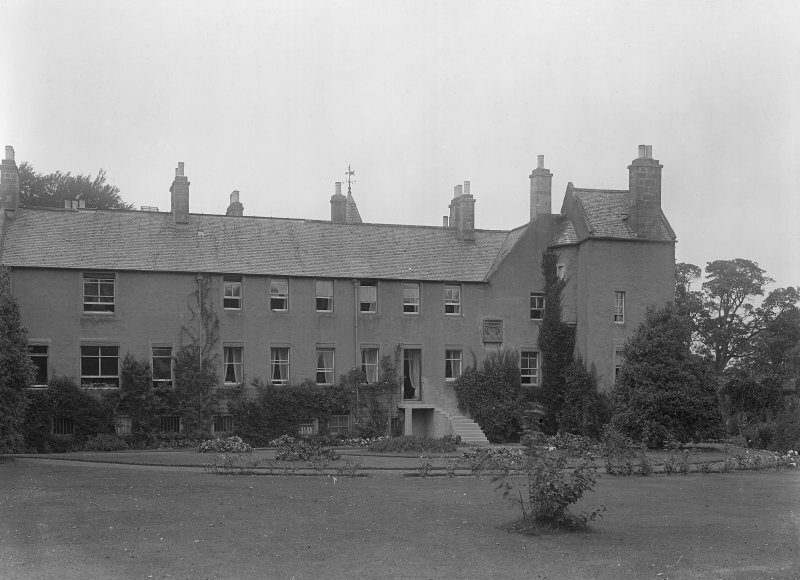 He wishes payment for his work at Keith House and for the new staircase on the front of the house of Nether Keith. Keith. 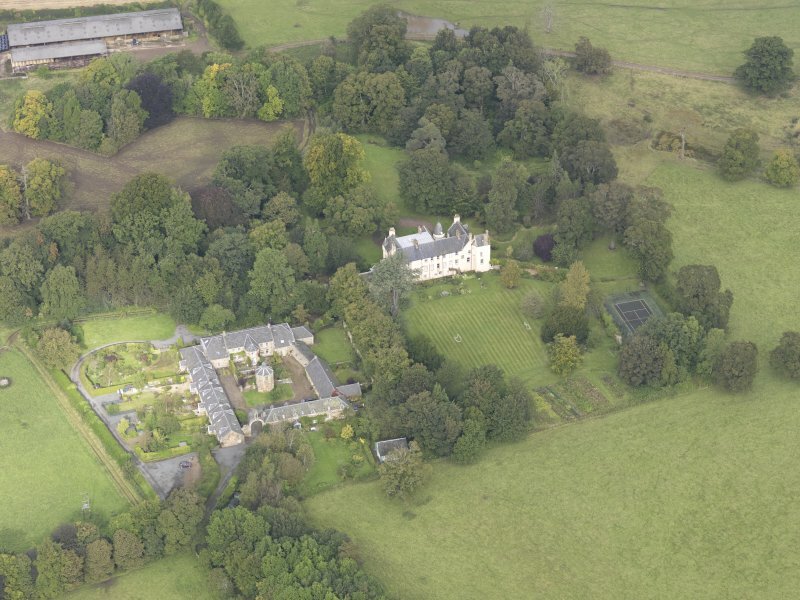 Parks and garden of Keith House.